Trunks: Trunks usually single, to 1 foot in diameter; bark gray, smooth on young trees, reddish brown, furrowed on mature trees. Twigs: Slender, pliable, dark brown to nearly black; leaf scars crescent-shaped. Leaves: Alternate, simple, deciduous, long-stalked, heart- to kidney-shaped, 3 to 5 1/2 inches long, 2 to 5 inches wide, dark green and glabrous above, pale and glabrous or slightly pubescent below; margins entire; tips pointed or notched. Flowers: On red stalks 1/2 to 3/4 inch long; calyces 5-lobed, purple, enlarged on lower side; corollas imperfectly papilionaceous, about 1/2 inch long, rose or pinkish purple; banner smaller than wings and keel; stamens 10, separate, in 2 rows. Fruit: Pods, oblong, 2 to 3 inches long, 2/5 to 3/5 inch wide, flattened, pointed at both ends; seeds 8-12, oval, smooth, brown. The pods turn brown and persist through the winter. Habitat: Stream banks, woodland borders, stony draws, thickets, and roadsides, on sandy or silt sites. 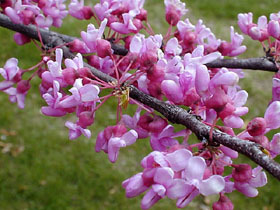 Uses: Redbud often is used as a landscaping plant. It has a spreading, rounded to flat-topped crown. Native Americans made a tea from the bark and drank it to treat fevers, congestion, and vomiting. The Kiowa viewed the blossoms as a sign of spring. Flowering branches were placed in their homes to "drive away winter". Comments: Redbud is the state tree of Oklahoma.